Derbyshire County FA Senior Challenge Cup Final. Gresley and Matlock Town. Pictured for Matlock is Michael Harcourt. Micky Harcourt must sit out the game and will also miss Tuesday night’s home Integro Doodson Sports League Cup meeting with Daventry Town on medical grounds, having been hurt during last weekend’s 2-2 draw with Sutton Coldfield Town. Harcourt and Craig Nelthorpe were both forced off with head injuries after separate altercations with visiting players 20 minutes into the match. Once order was restored after a delay of a quarter of an hour, Hume felt Matlock were “worse off” even though they had a one man advantage. 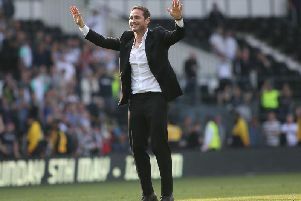 “It was two points dropped in one way but also what happened had a negative effect on us for a while and I had to have a good chat with the players at half time when they found themselves 2-1 down,” he said. Injuries ruled out captain Danny Holland, defender Harry Coates and loanee Ryan Fallowfield and although Holland and Coates should return to face Blyth, Fallowfield will again be out, as will Scott Maxfield who starts a two game ban after his dismissal at Spalding. “Hopefully there’ll be one player coming in this week but he’s cup tied,” said Hume. ““Danny was touch and go last week but it was too much of a risk to play him in case we ended up losing him for another two or three weeks. “Ryan’s out for two weeks and Harry picked up a slight niggle. It’s not ideal particularly against a good side like Blyth but we’ll get on and deal with it. “We need to get a couple of lads in but they must be the right ones and at the moment not cup tied. “People keep talking about loan players but we’ll never again get any of the calibre we got from Sheffield United last season, we were very lucky to get them, it can’t happen every year. “Clubs seem to be pushing their more established young players to Conference North and above, it’s the really young lads that seem to be coming to our level. “We’ve tried to bring three or four players in on permanent deals but they’ve decided to stay where they are. The Gladiators and Blyth met at this stage of the Trophy back in November 1993 when Spartans, then a leading Northern League club, won 3-1 at Causeway Lane. A replay if needed, will take place at Croft Park on Tuesday. Meanwhile Matlock have announced reduced admission charges for the Daventry tie of £8 for adults and £5 for concessions.